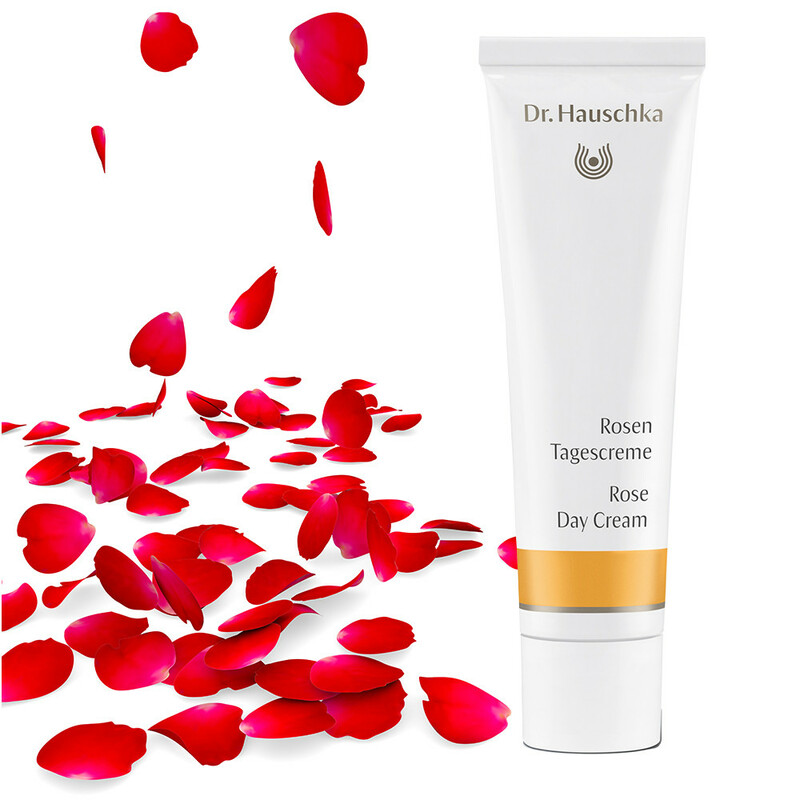 At the centre of the Dr. Hauschka range, the Rose Day Cream uses the natural strength and softness of the rose petal to hydrate and nourish your skin. Ideal to protect and nourish normal, dry and sensitive skin. A beautifully nourishing and rich day cream to compliment and perfect any skincare regime. Treating your dry or sensitive skin with care by cleansing morning and night with a soothing cleanser, such as Soothing Cleansing Milk, by Dr Hauschka, will lift away any impurities and pollutants stuck to the skin during the day and purify your skin after a night’s sleep. Complete this routine with Rose Day Cream to protect and nourish your skin every day. Combining extracts of Rose Petal and Wild Rose Hips to encourage the natural balance of your skin. The addition of Shea Butter, as well as a bit of Avocado oil, further protects and helps retain moisture – great for maturing skin – along with Marshmallow and St. John’s Wort which are perfect for soothing redness and dryness. This effective combination mimics the natural balance of your skin, encouraging it to repair and restore itself, bringing back a totally natural glow and radiance. Ideal skin: Perfect for dry, very dry, reddened and sensitive skin. Application: Apply Rose Day Cream after cleansing and toning your face in the morning, apply a small amount evenly to face, neck and décolleté. This is a great primer before applying make-up. Tip: Rose Day Cream provides excellent protection against the cold during winter. Rose Day Cream Light feels pleasant on your skin in the summer. Matching Products: Hydrating Cream Mask as the ideal complementary product for skin prone to dryness. Its precious plant oils and waxes noticeably care for the skin, leaving it feeling super soft. Ingredients: Water (Aqua), Arachis Hypogaea (Peanut) Oil, Beeswax (Cera Alba), Althaea Officinalis Root Extract, Rosa Damascena Flower Water, Hypericum Perforatum Flower/Leaf/Stem Extract, Butyrospermum Parkii (Shea) Butter, Sorbitan Olivate, Persea Gratissima (Avocado) Oil, Polyglyceryl-3 Polyricinoleate, Fragrance (Parfum)*, Citronellol*, Geraniol*, Linalool*, Limonene*, Citral*, Farnesol*, Benzyl Alcohol*, Eugenol*, Rosa Damascena Flower Extract, Rosa Canina Fruit Extract, Copernicia Cerifera (Carnauba) Wax, Zinc Sulfate, Lecithin, Rosa Damascena Flower Wax.